Candy making is not as simple as it looks. It takes techniques that only professional candy makers comprehend. Taking the candy making techniques from Europe, Crochet creates beautiful colorful candies for people to enjoy during any occasion. 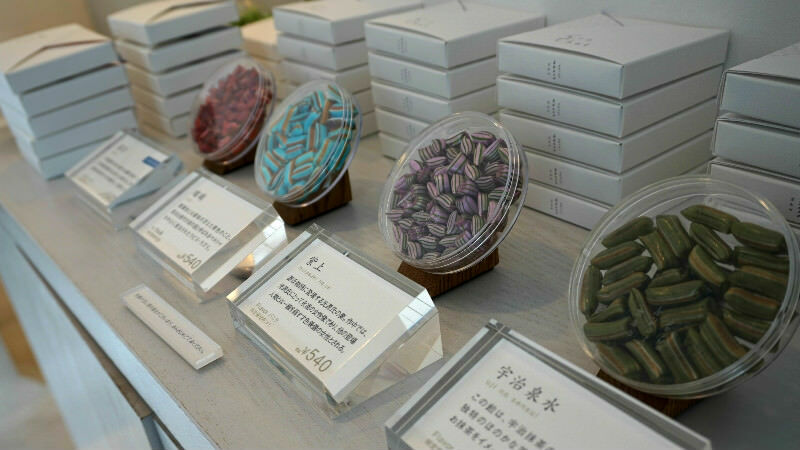 You can be assured that the candy at Crochet carries candies with colors that contain genuine flavors of fruits or other ingredients familiar to Japanese people like green tea or yuzu. These round striped candies resembling “temari” balls, or colorful balls made with kimono fabric, have been enjoyed in Kyoto for many years. Pictured above is one of their bestselling flavors of lemon lime with the product name of “Shiraginu Temari”. Now with new techniques, variety of flavors are made and offered in Crochet, there are certainly flavors available that each person will surely adore. There are two sizes of items available and all the candies are packaged in petri dish. Some of the flavors lined up in the stores include fruit mixes, peach soda, green tea, and red bean. The smaller size are priced from ￥324 and are great for mixing and matching for a box that fits 2 or 3 items. The candies are packaged very nicely making them a perfect gift for any occasion. For boxes fit for 2 or 3 items, there is a nice option of picking a wrapping paper. Thinking about the person you will be gifting to makes it extra special. The designs of the wrapping paper and packaging boxes are stylish you will certainly impress your loved one with these candies. There are several flavors that are seasonal and offered only for limited time. This one for example is called “Momo no Seku,” a peach flavored round candy only available during spring season. There is no particular scheduling for when seasonal candies are offered. You may find that one meant-to-be flavor when visiting Crochet. For candies to be boxed, you must purchase two or more items. Friendly staff will explain the flavors of the candies. The cute candies of every kind and flavor were so pretty that I was satisfied just looking at them! What's special about this shop is their white walls, and while it may look like hard to enter, once you do you will find out that the staff are exceptionally friendly! It is also nice that you can taste all of the candy before you buy them.